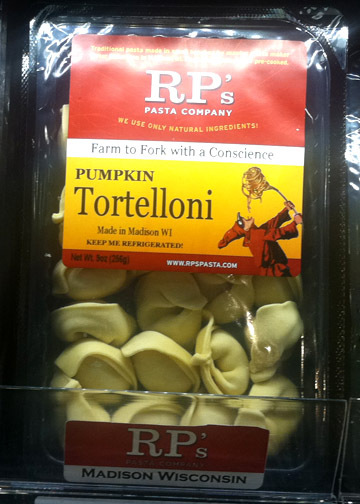 Another great Innovation Kitchen Partner at this year's Madison food and Wine Show was RP's Pasta. RP's Pasta was working from the Willy Street Co-op booth, sampling their wonderful pastas, including their amazing pumpkin tortelloni. Thanks, and great to catch up Kira! We help Peter and friends at RP's prepare fillings for their amazing pastas, including pumpkin. We are proud to support RP's goal of 'Farm to Fork with a Conscience'. "Although several commercial suppliers could make processed foods available, Robertson opted to go with the Mineral Point facility to provide vegetables for his stuffed ravioli and tortellini." "They did it fast. They did it efficiently. And it’s 100 percent Wisconsin products, he said." What a partnership! RP's pumpkin tortelloni was served at President and Mrs. Obama's January 2011 White House Super Bowl party (Packers win!). Thanks RP's Pasta for your partnership and support for the Innovation Kitchen! Original post about our Innovation Kitchen partnership with RP's Pasta. Willy Street Co-op. Thanks from my family, loyal Willy Street Co-op owner/members!